US data resulted upbeat but failed to motive market players. EUR/USD stuck around 1.1320 amid better market mood. Risk appetite persists at the beginning of the week, although the lack of relevant macroeconomic data, and a busy calendar ahead, keep majors within familiar levels. The EUR/USD pair advanced up to 1.1320, being unable once again to sustain gains above the 50% retracement of the 1.1447/1.1183 decline, now hovering a few pips above the 1.1300 mark. So far, the daily range of the pair barely surpassed 20 pips. German's central bank, the Bundesbank, released its monthly report, indicating that the country's economy grew moderately in the first quarter of the year, adding that the underlying growth trend remains subdued, nothing that could surprise market's participants. An update on the health of business growth will be out this Thursday, with April preliminary Markit PMI. The US just released the preliminary NY Empire State Manufacturing Index for April, which resulted at 10.1 vs. the expected 6.0, although the market didn't react to the positive headline. Later today, a couple of Fed speakers will hit the wires, scheduled to speak in different events. 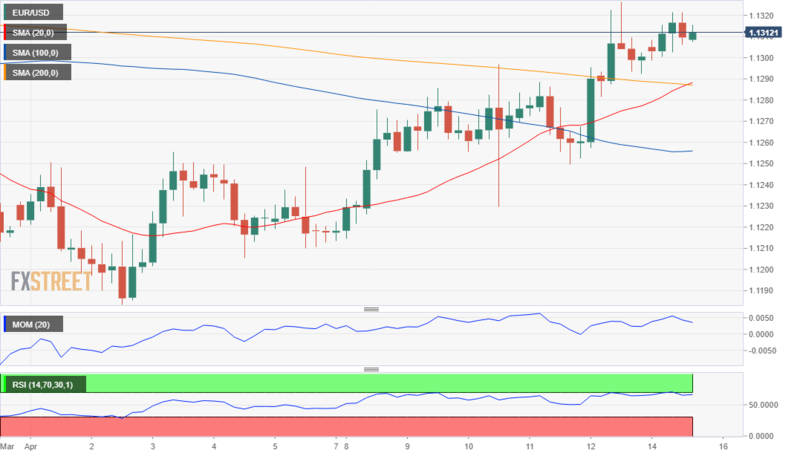 Ahead of Wall Street's opening, the pair trades at around 1.13 maintaining the positive tone according to technical readings in the 4 hours chart, despite the lack of progress. In the mentioned chart, technical indicators have lost upward strength but hold within positive ground, while the price holds above all of its moving averages, with the 20 SMA heading north above the 100 SMA and about to surpass the 200 SMA, all of them below the current level. Above the daily high, the pair has room to extend its advance up to the 1.1350 price zone, the 61.8% retracement of the mentioned decline.